All students start in this Introduction to Horsemanship class. Classes occur weekly for 8 weeks and there is no riding in this class. Students learn natural horsemanship "ground work" so that they can be accepted by the horse as the horse's "Alpha Leader". They learnhorse behavior so they can "read" how their horse is feeling. They learn grooming skills, how to move their horse in different directions, how to train their horse not to be anxious about various things, and how to round pen their horse (picture above). Our next 8 week class semester is beginning March 14, 15, 16, 2019. We also have class semesters planned to start May 23 and September 12, 2019. All you have to do to reserve a spot is call/email to see if openings are available for you. 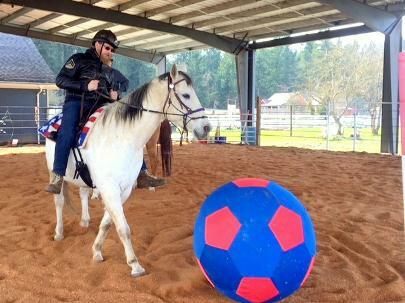 After completing "Introduction to Horsemanship", students start this Second Level program, "Introduction to Riding", which also occurs weekly for 8 weeks. Students learn how to put their saddle pad, saddle, and bridle on their horse. They learn mounting and balance as well as various methods to "cue" or direct their horse. They also learn emergency techniques. Students can expand their horsemanship skills after completing their second level classes "Introduction to Riding". In this advanced riding level, students get to practice moving their horse through obstacles, first on the ground with the horse on a lead rope, and then riding. A strong level of trust is developed between the rider and the horse that "both" will do their part to navigate the obstacle. There is no end to the learning of advanced horsemanship skills for the student that comes to Hope for Heroes Horsemanship.